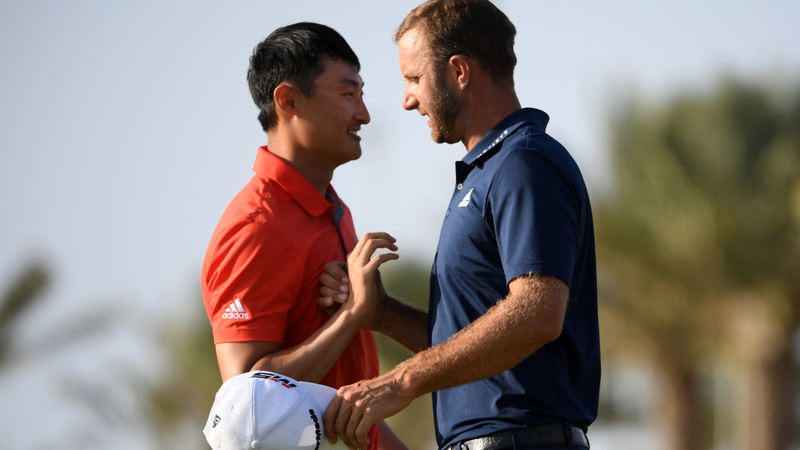 Dustin Johnson out-played Haotong Li on the back nine to get the win. Dustin Johnson had never won a regular event on the European Tour. D.J. moved past the political controversy, the sparse crowds and the tough-to-read paspalum greens and finally popped his cherry on the European Tour. Johnson overcame a driver that was wayward most of the day and some pretty poor shots at times during the final 18 as he tried to shake off 54-hole co-leader Haotong Li. This one was in doubt most of the way. Li helped Johnson out with three bogeys over the first five holes on the back nine, allowing Johnson some breathing room. D.J. found himself in trouble at the scenic par three 16th, where he pulled his eight-iron tee shot on the 165-yard hole into the Red Sea. He found himself needing to hole a 10-footer for bogey to keep the lead and he jarred it. Johnson pretty much put things out of reach when he nearly drove the par four 17th and putted from the fringe for an easy birdie to move two in front of Li. A closing birdie was good for 67 and a 19-under par winning total, two clear of runnerup Li. Johnson’s driver kept him in the rough more times than not. “And you can’t hit it close when you’re in the rough,” Johnson said. “I didn’t have my best out there but I managed to get it done,” he said after notching his 20th world-wide win, 19 of those are on the PGA Tour. “It feels really good,” Johnson continued. “Any time you can win a professional golf tournament, no matter where it is in the world, it’s a big win. I’m honored to be the champion and I’m very pleased with the win. The things that I’ve been working on are working and I’ve still got a lot of room for improvement. I’m very pleased with where the game is at. “I’ve got a lot of confidence in what I’m doing and I feel like I’m hitting a lot of really good golf shots. So misses are starting to get better and I’m not making as many mistakes, even though I did on 16. But for the most part, that was about the only really bad shot I hit this week,” Johnson pointed out. Johnson’s win ended a week of controversy that had a chapter added to it with the Saturday disqualification of Sergio Garcia, who threw fits of anger during his third round and pounded his putter into the green surfaces on multiple holes, causing damage to the putting surfaces. Bryson DeChambeau ended a successful two weeks in the Mid-East. He closed with a 65 and finished tied for sixth. Brooks Koepka, ranked second in the world coming into the week, floundered all week, ended up two-over and tied for 57th. That finish allowed Johnson, the tournament winner, to move to No. 2 when the new rankings come out this week.